With bottled water sales trending up for the past several years, including an 8.9% bump in 2015, an upbeat crowd gathered at the Gaylord Opryland Hotel in Nashville, TN this month for the joint International Bottled Water Association (IBWA) and the National Automatic Merchandising Association (NAMA) conferences. The two organizations have met together annually since 2012. 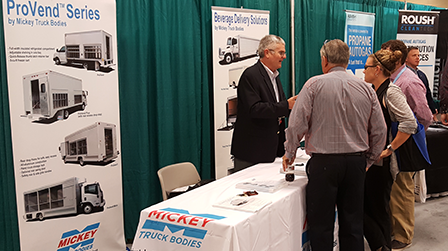 “It was a very busy trade show for us,” says Tom Arland, Mickey Vice President of Beverage, Van & Specialty Vehicle Sales. “We had meaningful discussions with many of our existing customers as well as with prospects, including one from Fiji that was interested in our ProVend line of vending bodies. Both audiences – water and vending – were impressed with our broad range of delivery solutions. They want customized configurations that will help make their routes more efficient and more profitable, and that’s what we specialize in – custom-built delivery solutions. Attendees to the joint conference also expressed interest in Mickey’s reconditioning services, used equipment and alternative fuel applications based on its work with Roush CleanTech on Nestle Waters’ propane-powered fleet. “It’s clear that the industries we serve view Mickey Truck Bodies as a single-stop resource for all of their delivery needs,” according to Tom.